That is not true and showing Turks as nationalists is unfair. 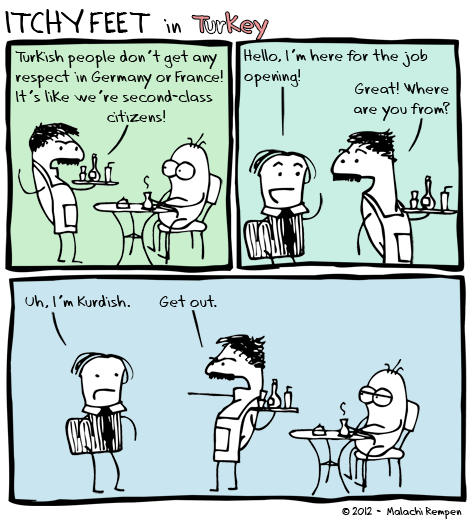 Most of the business are owned by Kurds and we love them. Plus we don't wear fez nor look like Aladdin. Did you really ever visit Turkey? Yeah I have to admit, this is not my best work. In fact this comic is probably my worst. So I don't blame you for disliking it. I did not understand the situation I was writing about, and it actually inspired me to stay out of political matters in future comics. That's why I keep it up - to remind me what happens when I make a comic on something I know nothing about. Although the guy isn't wearing a fez...?